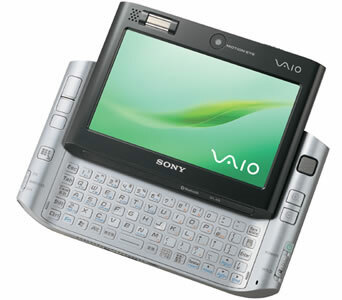 Sony VAIO UX-50 portable handheld PC or micro PC or Ultra Mobile PC (UMPC) which weighs only a light 520 grams, and measures tiny 150mm x 95mm x 32mm, and is the evolution of Sony’s 2002 “Bio U” concept device. Sony UX-50 feature Intel Centrino Core Solo U1300 1.06GHz processor with SpeedStep, Intel 945GMS Express chipset, 512MB DDR2 400MHz memory, Intel GMA 950 on board graphics adapter with 128MB shared memory, 4.5 inch 1024×600 touchscreen TFT LCD, UltraATA/100 hard disk, USB2.0, IEEE802.11a/b/g Wireless LAN on board, Bluetooth 2.0+EDR, Compact Flash Card slot TypeII, Memory Stick slot and runs on Windows XP Home Edition Service Pack 2. UX-50 also has the ability to integrate with VGP-BGU1 Bluetooth GPS unit for GPS navigation in car. CIO Tech Informer (dead link) reviews Sony Vaio VGN-UX50 Handheld PC and concludes that the UX50 is clearly a clever product with plenty going for it if, and that’s a big if, you can find a real need for it. At $1,500-plus, it is far from cheap, which really is the bottom line for anyone wanting an entry-level PC. And realistically, that’s precisely how this performs. Yes, I’m prepared for a wave of criticism pointing out the multitude of high-end features. All I can say in response is that doubters should try it out and see what they reckon. Finally, the 520-gram weight of the UX50 is likely to split opinion down the middle. I found it too heavy to sway me from me 900-gram Toshiba laptop. Why save just 400 grams but sacrifice a proper keyboard, much larger screen and great battery life? Eddie Yip has also posted on YouTube a series of video clips on tests and information of Sony VAIO UX-50 shown as below.